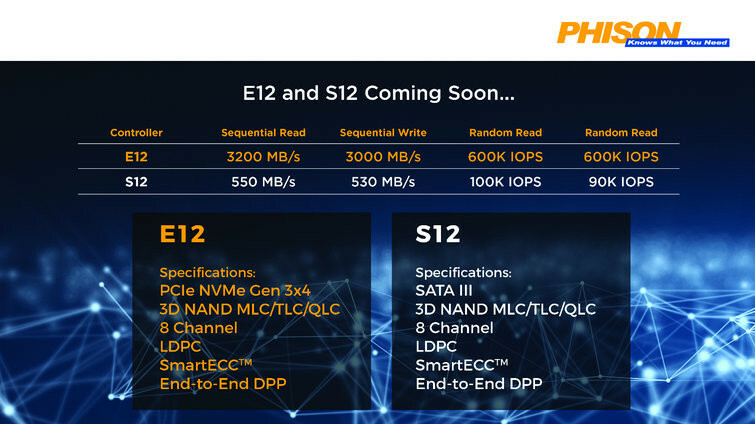 Phison isn't just a budget controller brand, as you well know, so in addition to their interesting, 2-channel NVMe NAND controller in the Phison E8, which should see products hitting retail in the following months, the company is also catering to the high performance crowds with the impressive E12 and S12 controllers. The E12 is definitely the star of Phison's new controller line-up - just look at those ratings of 3200 MB/s sequential read, 3000 MB/s sequential write, and 600K random read and random write IOPS. Naturally, those rated speeds should be taken with a measure of salt, as NAND type, its implementation and firmware tweaks all matter tremendously in extracting the best possible performance from high speed storage. Contrary to the E8 budget Phison controller, the E12 will feature a full NVMe PCIe x4 interface, which allows for those speed ratings. The S12, on the other hand, is a more common SATA III controller, which means that its speeds of 550 MB/s sequential read and 530 MB/s sequential write are already hitting the interface's limits. Other than the interface and the rated speeds and IOPS, though, the specs are the same on these controllers: support for 3D NAND on MLC/TLC/QLC arrangements, 8-channel, LDPC, SmartECC, and End-to-End DPP support.